Adding to my repertoire of vegetarian recipes is one of the most unusual but most delicious things I’ve tried in a very long time. I adapted it slightly, but the original can be found here. These taste sort of like savoury Welsh Cakes. Anyone who has had Welsh Cakes will know that this is in no way, shape or form a bad thing. They take a while to make (about 30 minutes of prep) but they are so worth it. When I made these for my dad he didn’t shut up about them for two weeks, which I always take as a good sign. With these fritters you get a warm pepper relish. This is truly the food of the Gods. One of the nicest things I’ve ever tasted, even though its main component is tomato and I can’t stand them. It’s lush. I had some that was leftover the next day with omelette, and it just made it taste a million times better. 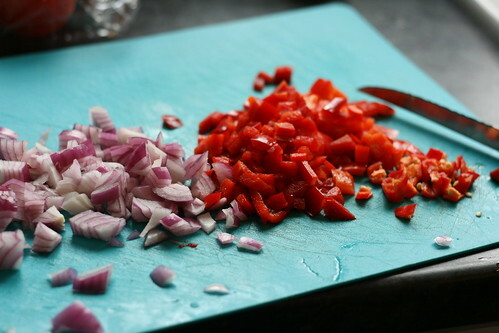 Dice the onion, deseed and chop the peppers, crush the garlic and chop the chilli but leave the seeds in. 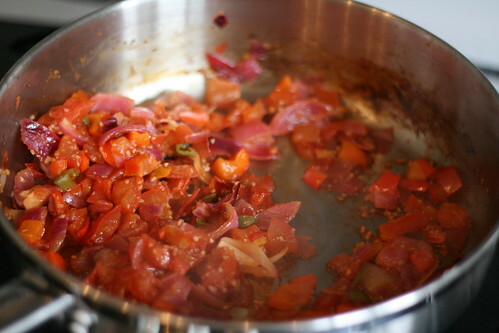 Put the onion, peppers, garlic and the chilli in a pan sprayed with Fry Light. 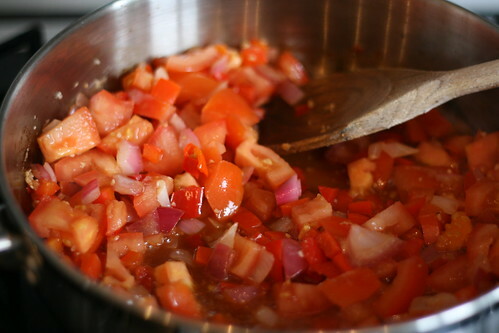 Fry them for a few minutes to soften them before adding the tomatoes, sugar and vinegar. 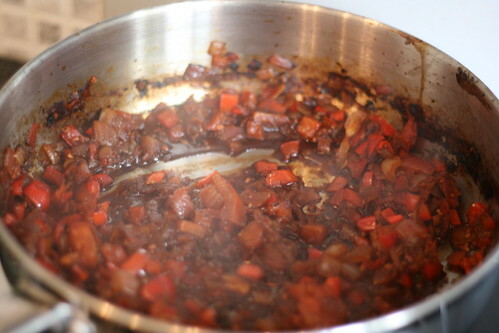 Cover the pan and let it simmer for 30 minutes, before taking the lid off and letting it simmer for another 10 minutes. The first time I did this I put it over too high a heat and the liquid all evaporated; I added more water but then the burnt ick from the pan was all washed up with the water and burnt its way onto the relish. It tasted good, but looked horrid. The second time I kept the heat lower and that seemed to work better. 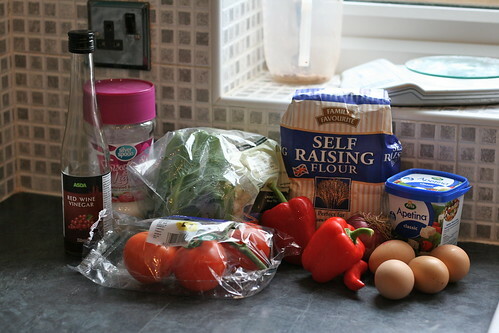 But anyway, whilst it’s simmering away you can start making the fritters. Put a large saucepan of water on to boil, cut the cauliflower into quarters and remove the central large stalk. 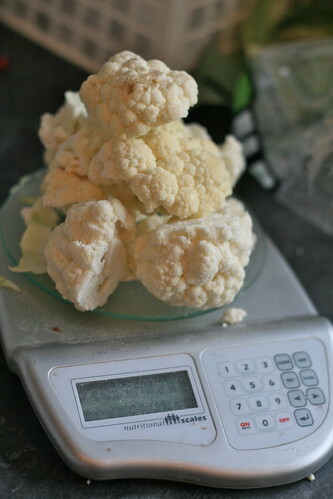 Then weigh out 350g of the cauliflower. 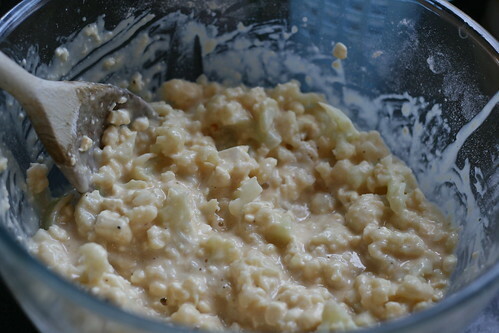 This needs to be roughly chopped, so you end up with a mix of bit and small bits of cauliflower. If, like me, you got bored of chopping fairly quickly and ended up with some utterly huge chunks with smaller chunks, don’t worry — you can squish them down later. When the water is boiling pour all the cauliflower into the pan, cover, and let it boil away for exactly three minutes. The recipe says exactly three minutes, I’m sure I probably let it boil for three minutes and fifteen seconds or so, but it was still fine for me so it probably will be for you too. Anyway, drain the cauliflower well before tipping it back into the saucepan and putting the pan over a very low heat, to dry the cauliflower out slightly. Take it off after a few minutes. Whilst that’s drying, make the batter. 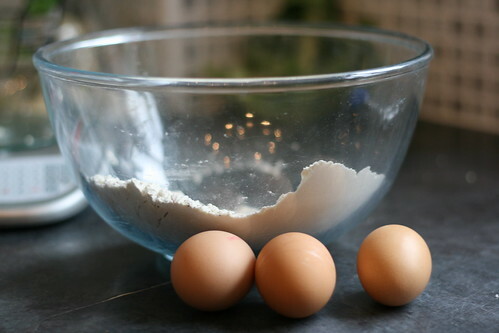 Put the flour into a large bowl with lots of black pepper; then gradually whisk in the beaten eggs until you have a smooth batter. 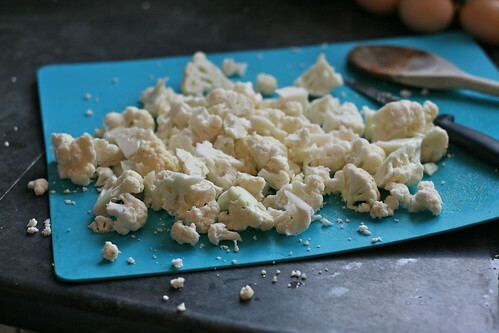 Then crumble in the feta cheese (this takes flipping ages) and the chopped parsley before stirring in all the cauliflower. Break up any big bits. Ahem. It looks quite disgusting at this point, but it’s okay because it smells nice and the relish should be filling your house with a beautiful sweet, spicy smell. And now comes the fun part — frying your fritters. 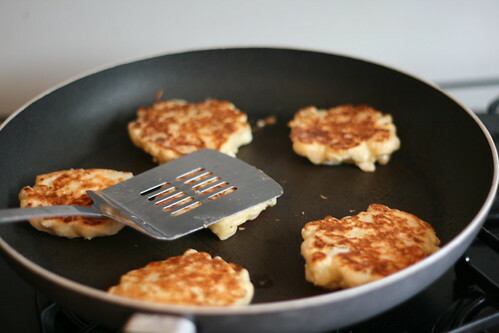 Heat a large saucepan until it’s as hot as hell, spray with Fry Light and then drop heaped tablespoons of the mix onto it, flattening them out slightly with the back of your spoon to make 10-12cm round fritters. After three minutes or so, lift one up using a fish slice and check the bottom. If it’s golden, spray the area it was just on and flip it over onto the uncooked side. 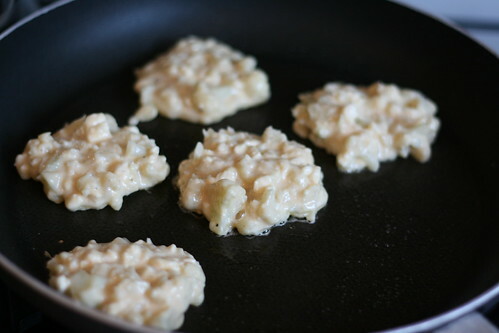 Press the top of the fritters slightly to flatten it again. When it’s ready, transfer it on a plate and pop it in the oven/under the grill on a low heat to keep warm. When they’re ready, just pile on a plate alongside some relish and a salad. OmnomnomnomNOM! I’m definitely going to make these again in the future, but I’m thinking of experimenting slightly. I bet making them with courgette would be gorgeous, although that could be because I like the taste of courgette and feta together. What do you think would be a good filling for these? Ooo, it could do! Give it a try and let me know?